The human Spine is the column that stretches down the midline of the trunk from the base of the skull to the pelvis. The spine is made up of a series of bones that are stacked like blocks on top of each other with cushion called discs in between to help absorb shock/load, hence making it literally the supporting structure of the body. Our experts at GESCO help your spine in overall health. 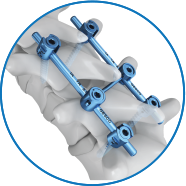 Please feel free to contact us for your spine related care.